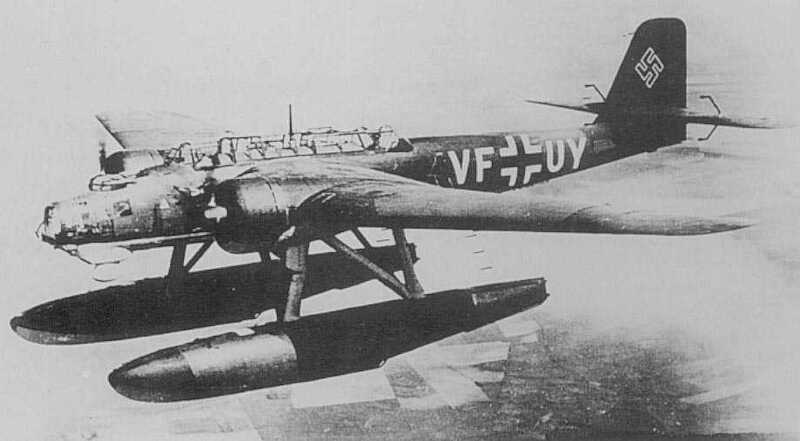 The Heinkel He 115 was a World War II Luftwaffe seaplane. With three crew, it was used as a torpedo bomber and and minelayer, and for reconnaissance and other duties. It was powered by two 720 kW (960 hp) BMW 132K nine-cylinder air-cooled radial engines. Later models had provision for an additional crew member, had uprated engines, and used different weapon configurations. The type originated from a 1935 Reich Air Ministry (Reichsluftfahrtministerium or RLM) requirement for a twin engined general purpose floatplane, suitable both for patrol and for anti-shipping strikes with bombs and torpedoes. Proposals were received from both Heinkel Flugzeugwerke and from Blohm & Voss' aircraft subsidiary, Hamburger Flugzeugbau. On 1 November 1935, orders were placed with both manufacturers, each for three prototypes each of their respective designs, the He 115 and the Ha 140. The first prototypes flew in August 1937 and the type was chosen in preference to the Ha 140 early in 1938. An additional He 115 prototype and 10 pre-production aircraft were then ordered. Meanwhile, the first prototype was used to set a series of international records for floatplanes over 1,000 km (621 mi) and 2,000 km (1,243 mi) closed circuits at a speed of 328 km/h (204 mph). At the beginning of the war, the He 115 was used for dropping parachute mines in British waters, normally aiming for narrow passages in close vicinity of heavily-trafficked ports on the English south coast. Six He 115s were delivered to the Royal Norwegian Navy Air Service in late 1939. Five saw service against the Germans during the Norwegian Campaign of April-June 1940, one being captured by the Germans at the beginning of the invasion. Two models, however, were seized from the Germans, so seven in all were used in operations against the Germans. Four aircraft were later successfully to escape to Britain and were subsequently used in covert operations with Norwegian crews off Norway and in the Mediterranean Sea, in RAF colours. One Norwegian aircraft escaped to Finland, where it was interned, and later used by the Finnish Air Force. The Swedish Air Force operated 12 He 115s under the local designation T2. Another six aircraft were ordered, but never delivered due to the outbreak of hostilities.